Let’s get the bad news out of the way first: in the past couple of years, massive inflation and the falling value of the peso has turned Buenos Aires into one of the most expensive cities in Latin America. In addition to that, foreigners can no longer rely on the generous dólar azul (“blue dollar”) black market exchange rate since the currency restrictions were lifted in late 2015. And the good news? You can still have a great time in Buenos Aires without going bust. While peso-pinching might take some getting used to, it is also a good reason to steer clear of the obvious tourist traps, get creative, and immerse yourself in the local culture. For free cultural events, head over to Centro Cultural Kirchner (CCK), Latin America’s largest cultural center. The center is an architectural achievement in its own right, coupling classical grandeur — the building was once the central post office and then Peron’s HQ — with modern elements, such as a state-of-the-art concert hall that floats in the center of the building. AT CCK, your choices range from art exhibitions, classical music, and poetry readings to yoga, tango classes, and the occasional star-gazing session on the rooftop terrace. To get free tickets you have to reserve your spot in advance on the website and pick them up at least one hour before the show. Keep in mind that the CCK is very popular with locals and visitors alike and the best events can get booked up quite far in advance! If you prefer to fly by the seat of your pants, you can also just drop by in the hour before the event when they start giving out the tickets that have not been booked up online. The city also has 36 smaller cultural centers in different neighborhoods, all of which offer a free cultural program. While it can be a bit hit and miss, it’s worth checking out your local center to see what’s going on (click here for a map of all the Centros Culturales around town). 2. Choose an affordable lunch option. A limited budget doesn’t mean you have to limit yourself to a diet of hostel breakfasts, empanadas, and choripáns. Around lunchtime, keep an eye out for so-called “tenedor libre” (lit. “free fork”) restaurants. Some only offer all-you-can-eat buffets, but in most you can also fill up your takeaway container at the buffet and pay by weight (“comida por peso”), resulting in a made-to-measure meal that is much more affordable than eating at a restaurant. This is also a great option for vegetarians who might find themselves less than thrilled with the usual Argentinian fare — for exclusively vegetarian buffets check out Green Life (Av. Corrientes 1915) and Konu (Tte. Gral. Juan Domingo Perón 1319). As in all buffet scenarios, the food is best early on. If you want to keep things eco-friendly, bring along your own container and have it weighed at the counter before filling it with food. 3. Tango at La Glorieta de Belgrano. 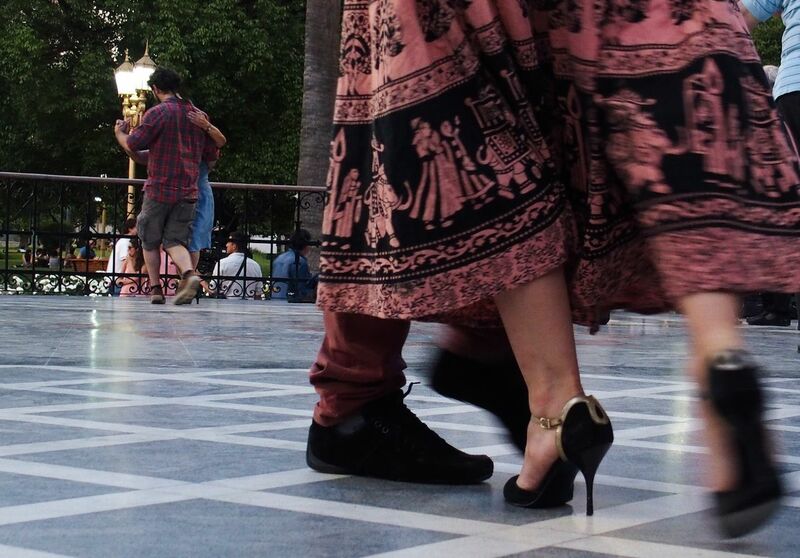 There is no shortage of places where you can see tango being danced in Buenos Aires, but if you’re a foreigner on a short visit you’ll more likely than not end up overpaying for a performance that’s about as authentic as a gondola ride in Venice. This is not the case with La Glorieta de Belgrano, a marble pavilion with leafy surroundings and two decades of tango history under its belt. Milongas (a word that refers both to a style of tango as well as to the social events where it is danced) are held there every Saturday and Sunday from around 8pm onwards and are open to everybody for free. Even if you have no desire to dance yourself, it is a great place to enjoy the music and observe the dancers who include beginners trying not to fumble their steps, professional dancers looking for some informal practice, and old couples who have clearly been dancing tango together for longer than I have been alive. At around half a dollar per ride, the city buses in Buenos Aires (called colectivos) are the cheapest, and often the most entertaining, way to get across town. (Sure, your odds of getting lost are much lower on the subway, but where’s the fun in getting around a new town underground?) The Guía T, a small booklet filled with maps and bus numbers, is the “bus bible” of Buenos Aires and can be bought in most kiosks, through relying on your smartphone is certainly easier for the uninitiated. Google Maps and the app BA Cómo Llego can help you make sense of the madness. First, get a SUBE card at a kiosk and put some money on it — you will need it to pay for the underground as well as for buses. Once you’ve figured out the route you want to take, the real fun starts: finding the bus stop. These are usually marked by a sign displaying the route numbers that stop there, though in more residential neighborhoods the stop might only be marked little numbers posted on trees or buildings. If you see people queuing on the sidewalk for no apparent reason, there’s a good chance there’s a bus stop there. When you see your bus approaching, flag it down by raising your arm. Once on board tell the bus driver your destination so he knows how much to charge you. 5. 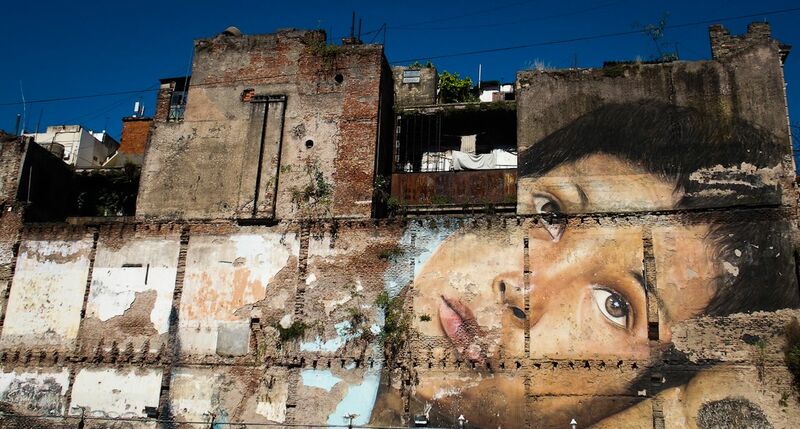 Go on a DIY street art safari. 6. Free entry to museums and galleries. Many museums and galleries in Buenos Aires offer free or discounted entry once a week, so a budget-friendly museum binge only takes a bit of planning. Free for students and seniors every Wednesday, and half-price for everyone else. A labyrinthine city of tombs that is the final resting place of Evita Peron and many other notable Argentinians. There are a number of parks around town where you can go to recharge or even take part in some free yoga or salsa classes organized by the city (check the website to see where & when). The Bosques de Palermo (Forests of Palermo) is a popular hangout spot, though it can get quite crowded on the weekend and the beauty of its rose garden depends on the time of year. Nearby is the Jardín Botánico Carlos Thays with many themed gardens and a couple of greenhouses, all with a charmingly dilapidated vibe. 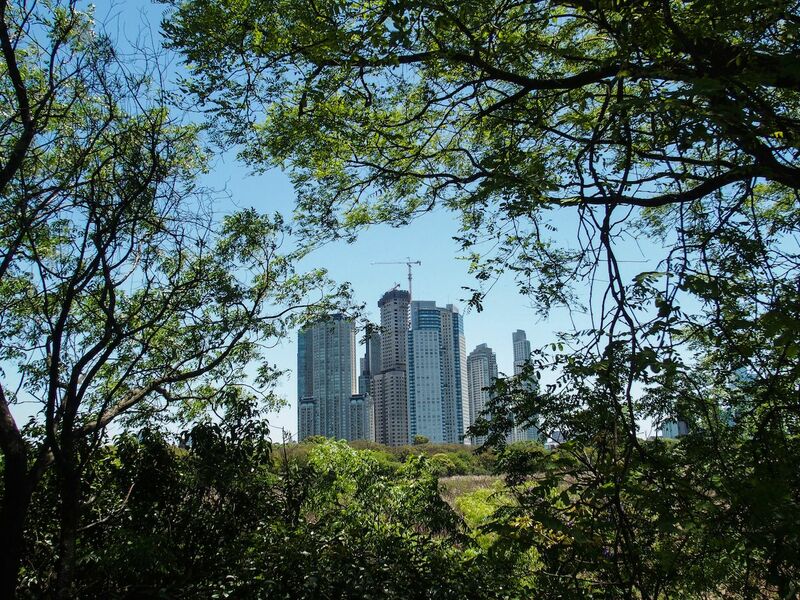 For a proper break head over to the Reserva Ecológica Costanera Sur, a large swathe of green land that was declared a national park in 1986. Still, it’s not exactly a thick European forest, so go early in the morning or late in the afternoon in the summer if you don’t want to get sunstroke. In addition to the recommendations above, it also pays to keep your eyes peeled for one-off events. If you want to stay up to date it’s time to brush up your Spanish (or enlist the help of Google Translate) and bookmark the website Gratis en Buenos Aires (listings of free cultural events around town), the Facebook page Espectaculos Gratis en Buenos Aires (ditto) and the official Buenos Aires website Disfrutemos BA for updates on events and festivals around town, many of which are free to attend.